Stars over La Silla observatory. View of the Large Magellanic Cloud over the 15 metre antenna of the (now decommissioned) Swedish-ESO Submillimeter Telescope (SEST) at the La Silla observatory in the southern Atacama Desert, Chile. This site is operated by the European Southern Observatory (ESO). 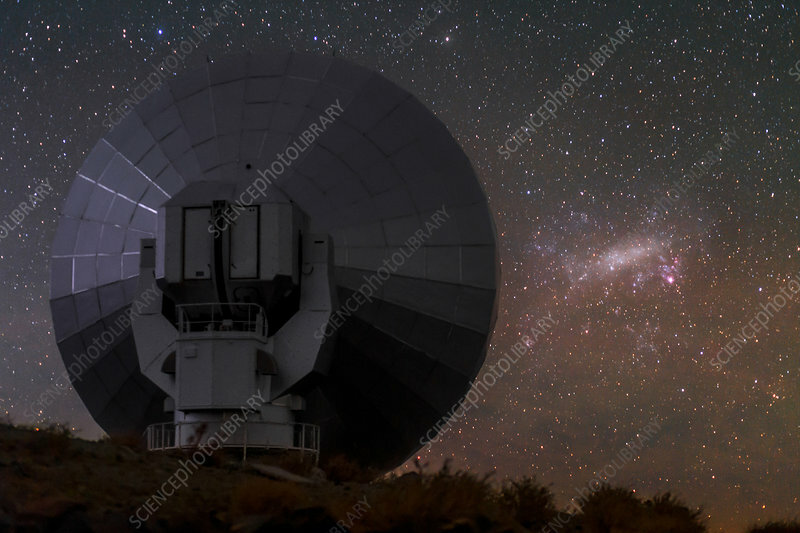 La Silla was ESO's first observing site and is still one of the leading observatories in the southern hemisphere. The Large Magellanic Cloud is a dwarf satellite galaxy of the Milky Way, lying around 160,000 light-years from Earth. The prominent pink-red patch just right of the galaxy centre is 30 Doradus, or the Tarantula Nebula.